Located in the Historic Himmarshee District of Fort Lauderdale, boasts an Italian Chef-Driven Menu, featuring Organic, locally sourced Artisan ingredients. Wood Fired Pizzas and Italian Specialties are the stars of the show. Fresh Pastas are hand crafted daily – and sauces are made from scratch and cooked to order. Pizza Masterpieces feature Imported Tomatoes, Homemade Mozzarella, “00” Flour and local/seasonal produce. Open Tuesday – Sunday (don’t forget about Sunday Brunch! ), Pizza Craft is the perfect spot for a family dinner or a late night rendezvous. Behind a pair of doors inside Pizza Craft, you’ll find a hidden high-end, speakeasy-style bar called The Apothecary 330. Red leather couches and walls adorned with turn-of-the-century knickknacks fill the space. Bartenders enamored with their craft-- constantly exploring the possibilities presented by unusual spirits, classic mixes and new flavor profiles. Visit Apothecary 330 before or after your dinner at Pizza Craft! Pizza Craft has a nice twist on your everyday Italian fare. Their oxtail lasagna was not only interesting but tasty. The giant meatballs were savory and well-prepared. Our other family members ordered a cheese pizza which they found hot and flavorful. The table also shared an order of fried calamari which was cooked and spiced perfectly. Portions are just right. Our waiter, Ben, was very nice and efficient. Pizza was good but pasta dishes were left uneaten. My wife ‘s salad was delivered without everything that supposed to be in it and when we returned it, she got a sliver of an egg and 2 chick peas. We had requested an inside table, but there were none available when we got there. We ended up outside, which was fine as that night was breezy. The waitress was amazing, even though they were very busy. The food is usually amazing here, tonight it wasn’t great. The pasta sauce was very watery and the pasta was not fully cooked. We were heading to the broward center so we didn’t want to wait for it to be redone. The pizza was good, but the two pasta dishes were not at all. I chalk it up to how busy they were, as I’ve never had a problem here before. If you are going to Broward Center, this is one of the few restaurants in the area fighting over who could be more mediocre. Perfect spot for cocktails and dinner before heading to the BCPA. 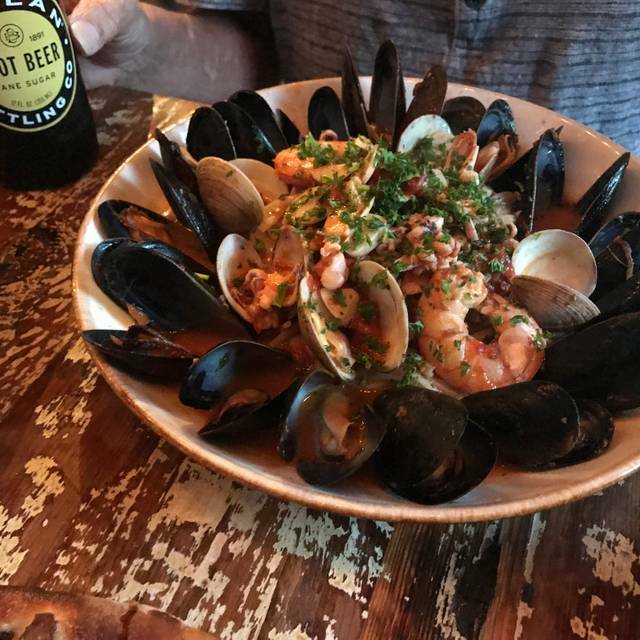 Delicious food and great craft cocktails. pC makes its own pastas and bufalo mozz in house. Their meatballs were excellent with a fine texture and sauce. The roasted cauliflower sits atop a tasty alfredo type sauce. The house salad was very disappointing because it was drenched in a too vinager-y dressing and the freshness of the veg didn’t come thru. Also it is open air and very noisy. Our server Francesca was very attentive even though she had many other tables in the restaurant. 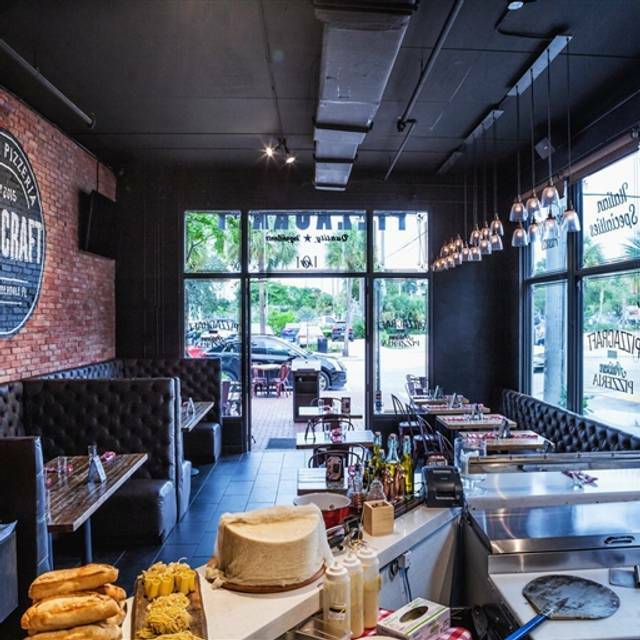 We love Pizza Craft and visit every time we go to Fort Lauderdale! The food is consistently delicious, the ambiance outside is perfect and the service is always fantastic! We highly recommend the Polenta Fries, I always crave them! Any time we are looking for somewhere to take out of town guests, we take them to Pizza Craft! Our food came out cold. We were going to order the meatballs as an appetizer, but the waitress recommended the crazy bread, so we ordered that instead. The meat inside was tasty, but the center was cold, which was very unappetizing. The pizza my daughter and I ordered to share, was okay, not terrible, just not worth coming back for. My husband ordered the oxtails, but wasn't impressed either. The waitress was nice, but not very attentive. Pizza is great. Brick oven if that's your thing. Happy hour pricing. But the Manager Ricky is everything that's wrong with human beings, and the service is spotty, and that's being nice. No real ambiance to speak of, wobbly tables, not much better than your average pizza place. Without getting into too much detail. The hype around sitting there eating your pizza is way over-rated. Get your pizza to go and eat it at home. Our 4 meals were each served at a different time. Two of us were eating while two had no food. Another dish was served. The last meal was served after the two were done eating.!!!!!!! My chopped salad was wilted & soggy. The server never mentioned the wine special until we asked about a happy hour price. Service was slow and the server acted like she didn't want to be there. Never got refills on drinks. Food was good tho. A pleasant surprise. We were looking for a casual Italian restaurant with a relaxed atmosphere and good food and we found it at Pizza Craft. We sat outside on a nice night and the staff was very welcoming and gracious. We started with a tasty bottle of Pino Grigio which was served cold. Our entrees of Chicken Milanese, Chicken Francese and Rigatoni Vodka were are delicious, served hot with hearty portions. The restaurant is on an active street with lots of bars but we found it entertaining and all part of the ambience. We finished dinner at about 10pm and were told that the area gets loud and crazy at about 10:30pm. We look forward to returning to Pizza Craft the next time we are in the area. The service was the star as our server Ally was super friendly and was very helpful with the menu. We all had a great experience. Thanks. Delicious food, great service and love the atmosphere. Second time here this week! We have our food made with gluten free pasta. It was superb! I won’t be back. Service was slow and food wasn’t as good as usual. Pasta was bland but the pizza was good. Ordered the heirloom and burrata but they forgot the basil. It was still good. Expensive for pizza but affordable if you split a pizza and have an appetizer. 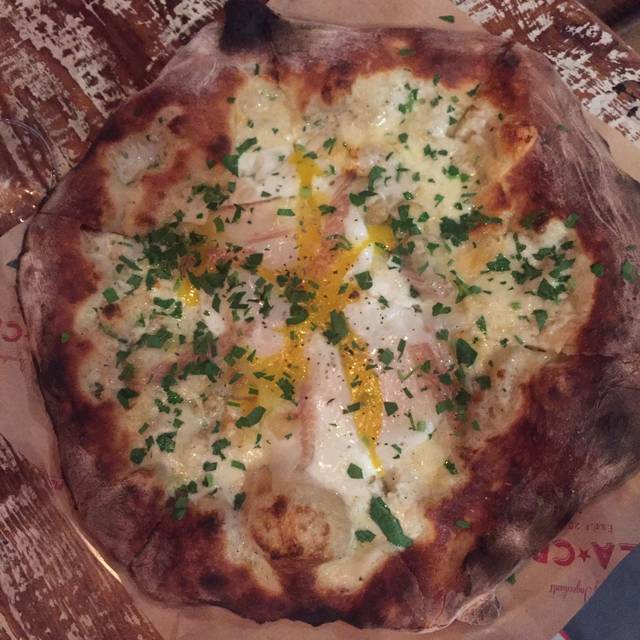 Loved the craft pizza. Very well prepared and tasty. The big hit for me was the Apothecary. It's hard to find a full service bar that actually mixes drinks the way they should be made. Such a fun and delicious experience at Pizza Craft! The food was awesome...especially the vegan pizza which I was thrilled to find on the menu. The salads were also good and my kids loved the tomato basil pizza. Our server, Francesca, was outstanding. Highly recommend...be sure to make reservations because it is a hot spot! Our go to place for Caesar salad and chicken parm. They seated us right away. Very busy for theater night. Service slow- glad we came early. manager or owner was yelling at the staff. It was really uncalled for. You can take someone aside and tell them quietly to do whatever. I felt sorry for the staff. We had chicken parm w spaghetti. Chicken was good. Spaghetti was not cooked fully ( ala dente) Waitress took it off the tab. Buratta was excellent. Yes I’d recommend it as it’s usulally good. My first experience was great! So I had expectations to experience the same. However, it was a disappointing experience. We ordered a Cheese Pizza with basil on the side (my son doesn't like it. But, I do) and Calamari. The pizza had to be returned because they didn't do what was asked. The calamari had more breadcrumbs then actual calamari. Not the way I like them. Overall, I didn't enjoy my meal and I was still hungry. I had to buy a snack at Broward Center for the Performing Arts before watching Hamilton. I don't think I'll choose them. Excellent food, we had a table on the patio and service was great. We have dined here a few times before a show at the Broward center, it is very convenient. The food is very good with a lot of items to choose from. We did make reservations which helped. We will difinitely be back ! The food was very good, and the service was excellent. We definitely enjoy eating here. The food was outstanding, the drinks were absolutely perfect and the server was very attentive. As we were going to see a show afterward, we let him know of our plans and he made certain that we were able to wrap up our bill with plenty of time to spare. Went to Craft before a show at Broward Center. Arrived at 6. Staff was very attentive and helpful, until the rest of the theater crowd arrived. After that we were pretty much ignored until I finally got our waitresses attention for the check. Would have liked to have had coffee and try a dessert but it was never offered. Not sure how long they have been in business but they should plan better for theater crowds. The food was great however! The pizza was excellent! The only disappointment was that you could not get toppings on one half of pizza and different toppings on other half. Best Before And After Show, Museum Visit. Excellent Thin Crust Pizza. I've eaten here 3 times. Food amazing. However, I made a reservation in between my shows through open table. Originally for 2 and online changed to 3. This change never made it to pizza craft. They wouldn't accommodate my 3rd plus I asked for outside on open table which they didn't have. Rude. Won't be back. Good food and good service. Perfect for before or after the theater. Pizza Craft has unique pasta. It is chewy rather than slimy which gives it a hearty texture. There was plenty of flavorful meat in the bolognese. I like the idea that you can order half or whole portions. The arugula salad was fresh and tasty and full of parm shavings. We also shared a tomato basil pizza which was very crisp and hot. We were told it was thin crust, but it was actually medium at the edges. The tiramisu was soft, fresh and delicious. Our wait person, Victoria, was a sweetheart, very friendly and attentive. This is a restaurant we would patronize again. It is a bit pricey, but you are getting quality food. I was extremely disappointed. Food was ok, service poor and paying the bill was horrific! When I approached the manager about the confusion with the bill he was of no help at all. If you should choose to eat here pay close attention to your bill and if you can, pay with cash.